March 23, 2012 -- AuntMinnie.com presents the second in a four-part series on overcoming work-related musculoskeletal issues for sonographers by Doug Wuebben, a cardiac sonographer, along with Mark Roozen, strength coach for the National Football League's (NFL) Cleveland Browns, and Joel Raether, strength coach for the National Lacrosse League's (NLL) Colorado Mammoth. Part 1 can be found here. There have been vast improvements in ergonomic equipment design and sonographer education and awareness, along with better industry standards and practice geared toward reducing sonographer injury. However, a huge percentage of sonographers still experience work-related musculoskeletal strain disorders (WRMSDs). More than 80% of sonographers are scanning in pain and 20% of these professionals eventually experience a career-ending injury. On average, within five years of entering the profession, sonographers experience pain while scanning, according to a 2000 survey by the Society of Diagnostic Medical Sonography (SDMS). It's been shown that this problem doesn't just affect the body; it also hits the pocket book. Consulting firm Sound Ergonomics found that the failure to address ergonomics in the workplace setting can result in $580,000 in revenue loss, medical bills, average cost of a worker's compensation claim, and new staff recruitment. That was back in 2003, and you can imagine the conversion to dollars today. Technology in and of itself isn't the answer. While better equipment, better education, and knowledge are important, we also need to explore the world of exercise and fitness. In general, advances in technology that have made our lives easier have also led to a decrease in our general fitness and health. Add to this the effects of time, gravity, and an injury or two and the result is biomechanical problems that take their physical toll on our bodies, causing damage and injury that eventually could end one's career. Slowed metabolism, increase in body-fat percentage, poor posture, uneven body symmetry, reduced flexibility, lack of stability, and loss of strength and power are all contributors that leave us adversely affected. In a work environment that relies on the body to function at high levels in a variety of positions, a common outcome is pain, injury, and loss of work time. Just by looking at the percent of WRMSDs, we can see that the technological improvements in equipment have not been sufficient to overcome these negative physiological effects. The misconceptions that arise from dependency on new equipment, better education, and improved instruction have deceptively misled professionals to believe that they can control every situation and guide patients to meet specific directions. Even following proper ergonomic standards, the sonographer may have to force themselves physically into positions that their bodies are not capable of. The result is poor body position, poor mechanics, and, most frequently, injury. We certainly are not saying that you shouldn't follow proper ergonomic standards. We also realize that at times, in almost any situation in life, we need to be ready to respond to the chaotic environment in which we operate. So when a situation arises that forces us to be in bad positions, the limiting factor for performance is our fitness level. The roadblock is the capacity of the body, not willpower, focus, or diligence. It's certainly not equipment or intellect. The good news is that the functionality of our bodies for work can be developed with proper training and conditioning. In working with people from the general population to elite athletes, we've found that the body is the most important element of injury-free existence. Keeping the body in some form of health and fitness level is vital. The best way to start is to get the background or skills necessary to give yourself the best opportunity for fitness success in your job. To do this, you may need to align yourself with highly skilled exercise therapists, corrective exercise kinesiologists, and personal trainers. When proper ergonomics instruction is combined with proper training and conditioning, even individuals with years of experience and wear and tear on their joints and muscles can expect to extend their professional careers by many years. Those just getting into the profession can avoid injury and improve their knowledge and skill level without having to stress about a major career change. We will now begin to cover the 10 biggest sins that can lead to chronic injury among sonographers, as identified by Carolyn Coffin, of Sound Ergonomics, in an April 6, 2010, article on AdvanceWeb. We'll examine the first two sins and complement the Sound Ergonomics advice with ways to improve performance from a fitness perspective. We'll show some very simple and basic exercises that can be done to help avoid injury. Ergonomic aid: Adjust the height of your exam table and chair. Performance aid: As we look to add training into our program, we have to look at how the body moves, how it stabilizes, what muscles are being worked, and the different ways to improve or enhance movement to improve performance. 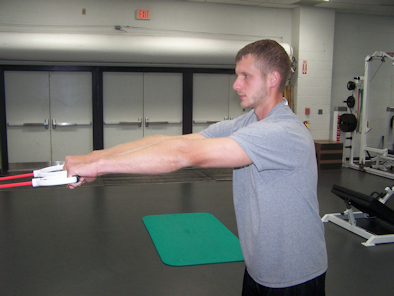 With arm abduction (lateral movement away from the midline of the body), moving the upper arm up to the side away from the body is only part of what we need to examine. We need to really look at shoulder articulation from abduction, adduction, flexion, extension, transverse adduction, transverse flexion, transverse abduction, transverse extension, and internal and external rotation. Remember, in everything we do, we want to train movement and not just muscle. If all we do is work to improve movement in one plane of motion, we are limiting progress and improvement. Our goal is to be able to function in all planes of motion, which helps us to perform our job in a variety of situations. Solution No. 1: Band High Row: Holding on to a resistance tube with palms facing down (figure 1), begin pulling the band toward the head and abduct the elbows as you row. At the end of movement, the elbows should be high and movement should be controlled (finish each repetition as shown in figure 2). Return to the start and do 10 repetitions. To increase difficulty, step back slightly, as this will increase the tension of the band. You can also increase the number of repetitions or sets performed. Solution No. 2: Corner Stretch: Find an open corner in a room. Stand with feet staggered, with elbows at shoulder height. 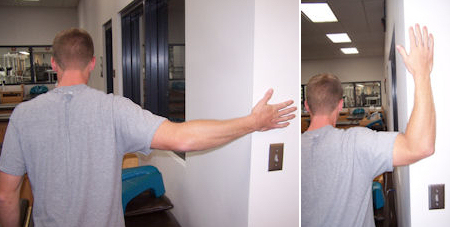 Place elbows and palms of the hands on the wall and lean forward, creating a stretch in the front of the chest and shoulder area (figures 3 and 4). Hold for 15 to 20 seconds and then release. This can be repeated two to three times per session. Ergonomic aid: Get closer to your patient. Performance aid: How often in your job do you have to reach more than 12 inches -- and for long periods of time? All day. Again, it's important to put yourself in the best possible position to decrease work intensity and reduce factors that can cause fatigue, which, in turn, can cause injury. But to assist in day-to-day performance, we need to develop strength in the shoulder and back area, increase the stability and support that the muscles of the shoulders and back can offer, and maintain mobility and flexibility in the muscles. The two simple moves below can make a world of difference in how you feel in those situations where you may need to reach past 12 inches. Solution No. 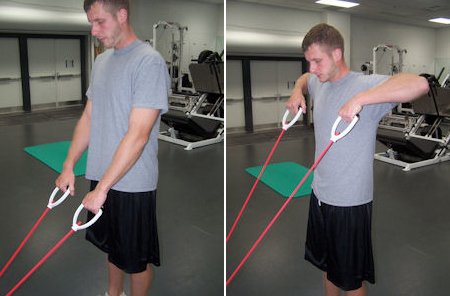 1: Band Shoulder Retraction. 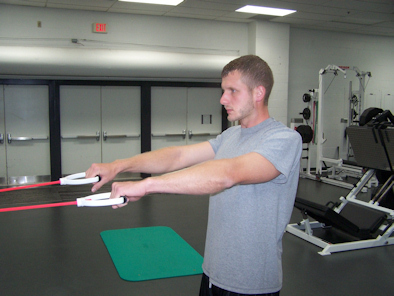 Hold on to a resistance band with palms facing down (as shown) and arms extended. Notice that in this case the subject is overreaching slightly forward (figure 5). From this position and maintaining straight arms, retract the shoulder blades back and try to pinch them together (figure 6). Hold this position for a two-count and then repeat for 10 repetitions. Keep an upright posture while performing this exercise. To increase difficulty, you may step back to increase the resistance, or you can increase the number of repetitions or sets performed. Solution No. 2: Standing Wall Stretch. With palms facing down and about arms-length away from the wall, look down toward the ground and extend the hips back away from wall. Place a comfortable amount of pressure on the hands (figures 7 and 8). You should feel a good stretch on the back of the arms, upper back, and shoulders. Hold for 15 to 20 seconds and then release. This can be repeated two to three times per session. Figure 7 (left) and figure 8 (right). We will cover the remaining sonography sins in our next two articles.